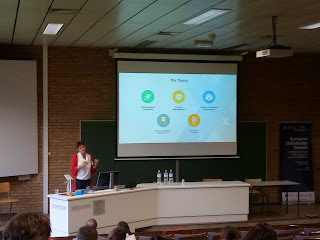 With the #eMOOCs2015 conference coming to a finish, it is time for me as the experience track chair to look back and think about what happened, how, and the feeling it gave me and possibly others as well. unprepared speakers taking the floor: an open call to speak ad hoc filling in open speaking spots. The idea: put the 5 best (= those who got the highest scores from the reviewing panel) papers of each conference track on a MOOC platform about 3 weeks before the conference. Ask the authors of those papers to make a short (= approx 5 min) video describing their MOOC project adding some key questions. Enable people - insight and outside of the conference - to have a look, pose questions, add comments... to all of these papers/videos. These videos and papers were put on the ConfX MOOC, which is available here. Once the conference started we needed to find a way to balance the discussion that could take place in the room: on the one hand there would be people in the room having seen the videos/read papers, but there would also be people in the room being new to the presented projects. So how do you drive a constructive discussion forward where these two audiences meet? The option we went for was: pecha kucha style: each of the participants in the f-2-f session had 20 slides, each taking up to 20 seconds, to describe their project. Leaving 18 minutes for questions and answers with the audience. Because this was a new format, an extra physical incentive was added: Belgian chocolates were given to all those participants that posed a question. How did it go? First the audience was hesitant, but as trust and confidence grew, people started to shout out their questions. Resulting in the end with 25 questions coming from the audience, providing real dialogues to take place in the room itself, a real treat. The wonderful, inspiring and public scholars Maha Bali ( @Bali_Maha ) and Rebecca Hogue ( @RJHogue )proposed a hangout, enabling non-conference audience to have a feel of what was happening at the conference, and have a chance to talk to some of the active people in the conference. This resulted in a recorded session spanning multiple continents. You can see the hangout here. Now just to understand how great Maha and Rebecca are: suddenly the connection dropped Whitney Kilgore and me out the hangout. And Maha had a back-up plan! 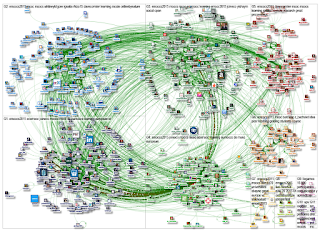 On the air she asked Aras Bozkurt to share his graph visualization from NodeXL where you could see the social media networks as they were created during the eMOOCs2015 conference, and his MOOCs, especially #rhizo15 and #edcmooc (this is a really great share!). This e-buddy style hangout is part of a concept by both Maha and Rebecca exploring a new type of conference option, and you can read more about it in Maha's blogpost here. As I was preparing for my session (a session of an hour and a half, normally with 3 speakers)... I thought I was the only speaker in that room as the timing of our session had come. So I decided to call out and ask if there was anyone in the room willing to take one of the open spots... and Brian Wernham from NooLearn (= an open MOOC platform that lets the crowd build online courses... really nice) took the chance and started preparing a 15 min presentation on the spot. Tiberio Feliz Murias, the wonderful chair of this session also got out and pulled in a wonderful extra presenter: Divina Frau-Meigs of the Sorbonne university in Paris. As these two speakers were found, one planned speaker showed up: Rémi Bachelet, with a great talk on MOOC peer assessments which you can see on slideshare here. So all of a sudden we were 4 speakers in the room, two planned speakers, two volunteering on the spot. And did it work? Yes! As in MOOCs, the people that actively participate are always people with wisdom, form which we all can learn. And indeed that happened in the room as well. New wisdom was shared, and new dialogues took place. So, for me, there were a lot of experiences happening in the experience track of the conference that lifted the interactions that were taking place. To me there is a parallel between life and moocs, if you keep opportunities open, new surprising knowledge will be created, and new networks will appear ... all of which make up the best moments in life, where magic happens. Thank you to all that engaged... it felt good. Conferences are really good meeting places, and they always mold my knowledge thanks to all the old/new people I meet and talk to. I often wonder whether they have more impact on my knowledge then the papers I read, simply because of the connection, the mutual dialogue that takes place. I am already looking forward to joining eMOOCs2016 in the beautiful Graz, Austria that will be lead by the wonderful Martin Ebner and Michael Kopp, and their colleagues. Mark your calendar, by the end of June 2015 the call for papers will already be out, so keep your keyboard/pen/mind alert. 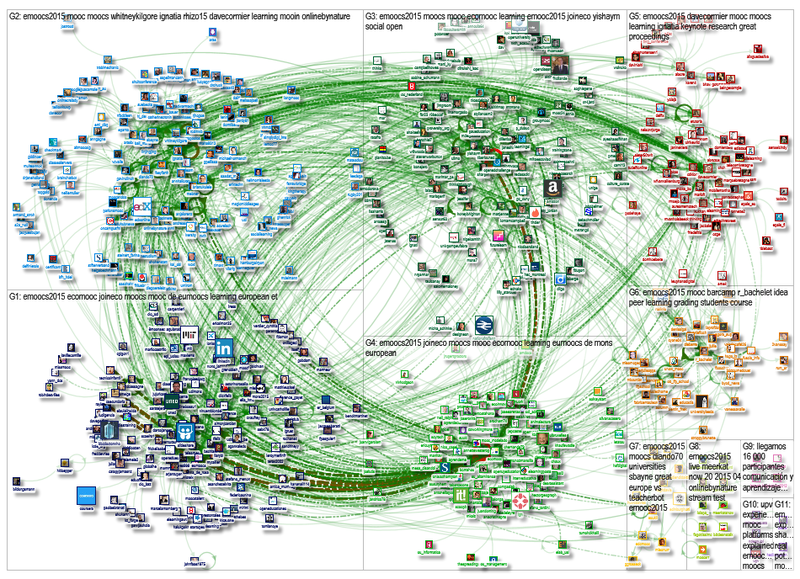 Marc Smith made the wonderful NodeXL graph visualizing the interactions, and networks that were happening at eMOOCs2015. Which reflects the importance of getting the word out while you are in a conference, enabling connections and exchanges to happen in- and outside of the venue. But also inspirational new people: Gavin Clinch, Darco Jansen, Divina Frau-Meigs, Sabine Schuman, Tiberio Feliz Murias, Ella Harmonic, JingJing Lin, Beatrice Capristan, Su White, Françoise Docq, Bruno Poellhuber, and many others... as my mind is still a bit sleepy after an intense three days. ... and while I was listening to them I realized why it is so important for me to see some people in real life. I felt how driven they were, why they care for others (ethical, philosophical awareness), which made me realize that passion (in action, in philosophy) is the way forward for any life I love. 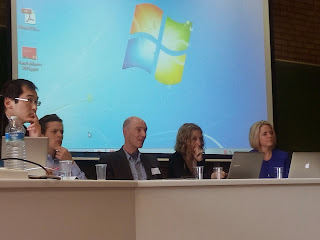 The eMOOCs2015 expert panel (Whitney Kilgore, Sian Bayne, Mike Sharples, Pierre Dubuc) sharing knowledge with all of us on the subject of social learning. What do you feel is social learning? Some pedagogies do not scale, eg sport teaching. Social learning: what becomes better when more people take part: more diverse views, more perspectives => conversations. The rich conversations in FutureLearn are essential to learning in the platform as all of human reflection (individual or collaborative) revolves around conversation. Social learning moves beyond learners and teachers, it is about participating in a course in such a way that you yourself learn, but also you yourself share what you know. In the last decade the challenge has always been to make teaching social, it is connected to learning, as you cannot have learning without having a social interaction. It is very human (Tautology discussion). Either with other humans, or other beings, or things. What is the effect of tools inside mooc platforms (likes, marked as done…)? Not everybody wants to be social, they do not necessarily take part in any action or discussion. The challenge is to make tools that feel very intuitive, so that the participation threshold would be really low (eg conversational discussions that go on and are not threaded). LinkedIn is the biggest professional platform which just acquired Lynda.com, but does this make it social? Lynda.com is not really a social learning platform, it is more a catalogue of videos, so less social. The intention of LinkedIn might have been that they have the sociograph, so they can fill the dots to become a social learning platform, maybe they can build it in by knowing what is missing and will work. But there is much to be done to do this. The merger is interesting, so the learning is on the inside. The thing that linkedin wants to do is to become the first stop on professional credentialing, so that is the play there. Adding degree would be of interest. We are short of time right now, so the bigger challenge would be to make learning quitter so that learning can happen. On the other hand, chaotic conversations bring people together, so simply the engagement with other people can be enriching. Amnesty International are very much offline, they are now creating a MOOC, but we want to create a social space that can be safe even though th participants will most probably sometimes use hard voices? How can we make a sanctuary? FutureLearn also had that anxiety, but in the end it did not happen for a number of reasons: the initial cohort of futurelearn based on known, good communicators (alumni OU eg), the discussions are not fully open, it is embedded in contexts related to learning content. When you get extreme views, immediately others come in and ask that person to provide evidence of what they propose, and because they attract less followers, the end up yelling in the desert of the course. FutureLearn uses a moderator company that looks at bad messages and sees whether they are indeed over the line. At the other hand, with such a company you risk of excluding people, so at which point do we need to have active moderation within a group of people who are interested in the topic. Anonymous or known commenting options? Because conversations can be taken out of MOOC platforms and used in research, it is pivotal (for ethical reasons) that those who participate in MOOCs use their own name. On the other side, it might still be necessary to be able to work in an anonymous way as well. How do you guide and direct conversations on a massive scale? Guidance is not necessarily (and to most adults not) necessary. LTI learning tool interoperability is of interest if you plan moocs and want to use different tools from outside. The latest tools do not make the most social learning, only those that survive can become social in use. What is your favourite sort of tech that is not yet had a tool solution? Citizens inquiry is still underdeveloped, anybody can start an investigation and others can join and all about science. That is not yet fully supported, but very interesting. 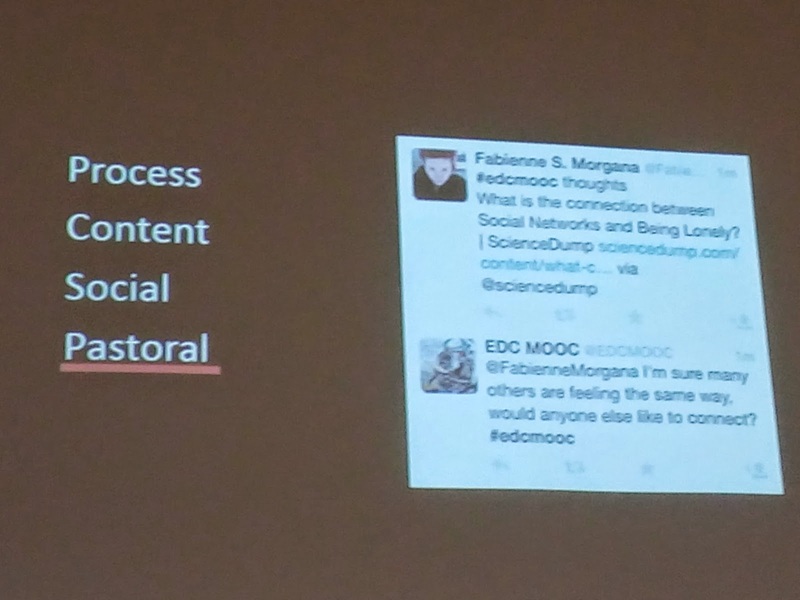 What is missing in social learning? You cannot divide the tech from the social, so I would like to see a more mutual emergent entities (entymological shift). The business models: sometimes there are very good ideas, but that do not go beyond the creation phase due to budgets, degrees. So it would be good to be able to ensure more successful learning based on durable business models. Continuity in connectivity, when adults were asked whether they did learn, and what they learned. Almost all adults (10 years ago study) said they were engaged in learning (language, sport, community…). Online these fields are disconnected, eg the art course in F-2-F is disconnected from MOOCs, so how can we connect this, and how can we create such communities of connected learners and fields, because over a lifetime these locations and connections change, so keeping on top of this makes it easy. Sustaining and maintaining communities is a challenge, through a number of tools, and they ask active engagement about (eg COP versus PLE). As digital educators we will help and shape those types of communities. Great keynote by Siän Bayne who is professor of digital education at the University of Edinburgh, UK, on teacherbot, a twitterbot used within an educational mooc. Really interesting from the automation point and social effect on the debate. Sian provides multiple references, so where possible I mention the author and year of the reference in this liveblog. Hot from the press Times Higher Ed article on Teacherbot here. By 2011 – Underwood and Luckin: AI in education are still not very well known about, not very well used, because we have not understood why to use them or how to use them. So there is a body of research which critiques this automated tutor. Feenberg, 2003: the goal is to replace fac-to-face teaching by professional faculty with an industrial product, infinitly reproducible at decreasing unit cost – critique. This has attracted a lot of funding opportunities, again it is very political. Who is thinking against this? Neil Selwyn has written many books describing the neo-liberal, capitalist lines of this automated vision. How can we respond to this automation function? Critical pedagogy approach would bring the focus back to the correlation with students and tutors (Clegg, 2003). Humans, academics and teachers working together. Instrumentalism: technologies are seen as neutral means employed for ends determined independitly by their users. Essentialism: technology has its own trajectory, humans need to adapt, like a Newtonian god, watche unaffected as the drama unfolds. This is something we must think about critically to move forward. Things and people need to learn to join – (Fenwick, Edwards and Sawchuck, 2011) focusing on the world and the dynamics in them. Whatmore, 2004: the human is always evolving and adapting to tech, we (tech and human) make each other. Twitterbots tweet on their own without any human action. 8,5 % tweets are deliverd by twitterbots. So it is an interesting, contemporative social form. Here are some examples. Bots of conviction: they can be all sorts of functions, with this bot being political. NRA Tally made by Mark Sample, two headlines made by darius kazemi. 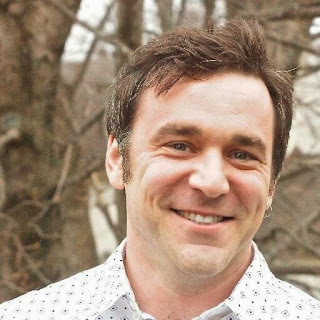 Rob dubbin wants to demystify what happens in the world through critical twitterbots. This bot wants to do some critical work on the boundaries of teacher and technology. Teacherbot ran from October/November 2014 in Coursera mooc (12000 enrollments). 50% of enrollers work in education, so should be perceptive to this critical teacherbot. Challenge was to make a teacherbot that was part of the curriculum. So now the answers of the bot were fed content from the course. Serious lessons: we never intended to trick the learners into thinking it was human. Everyone knew. Teacherbot got into a dark loop at first, with a fatalistic tweet, but then things settled down. Deficit => excess: based on teacher numbers. The teacherbot helped with creating excess. Supercession => entanglement: if we do automation right/wrong it will affect teachers. The question was to find what the interest would be for education as complimentary extra’s. What works => what do we want? Sian Bayne (2015) teacherbot in journal of higher education to be found here. This session is presented by Nomi Malca, and it provides a good idea of the international impact and challenges of MOOCs for employees in a worldwide company. These moocs are seen as personal development, not mandatory training. Employees need to work in their own time (or at least that is normally the only option considering the workload), and they get a certificate of accomplishment. So it demands a new culture to implement this new training for all the employees. For this MOOC it was important to start small, so for the pilot we had 30 – 40 people, eventually it became 300 learners in each closed course of the company. 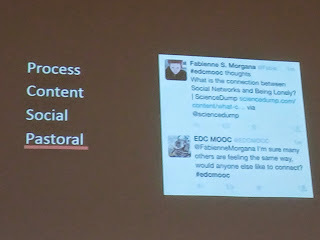 So each mooc is different, but using recorded videos, online sessions, links to external contents, reading material, hands-on sessions (this was considered as a priority), and creating a workers community (also perceived as important). The moocs were very interactive, as learners had two time zones to choose from. The hands-on sessions became important after people indicated that they wanted a completely directed process of practical implementation. External courses learned in groups: so learning MOOCs in groups, with some synchronic sessions to close the loop for the learner. The retention rate was higher then academic MOOCs, but not enough to get budgets for a corporate training. So the challenge is to increase these retention rate. 50% of the actual learners finished the course. They used an internal platform: Moodle out of the box, but inside of the organisation due to IP demands. Satisfaction based on positive vibe on MOOCs, so they all talk about it. The content was always meaningful: no compromising in comparison to classroom content. Organisational recognition of these moocs. This session is given by Sandra Soarez-Frazao and Yves Zech from RESCIF. Very interesting as I can see parallels between other North-South course challenges. Teaching support in this North-South context: lectures are organised in both institutions and teach each other’s. MOOCs can offer a different way of sharing teaching experience. With the global climate change water is becoming an increasingly important commodity, which is at the basis of choosing to organise this MOOC. Topic: dynamics of trained rivers from experience in Norther and Southern rivers. Designed for engineers that want to refresh their knowledge, or to understand all the basics that are needed for water measuring. And without intending it, citizens who had concerns about the environment came in as learners as well. Welcome week, four week course, personal project (choice of a problematic and a related real case. All the MOOC week topics are shared. They all build upon each other, so simple to complex. 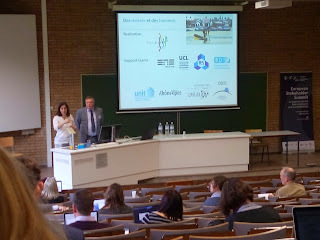 Remark from Sandra: because the MOOC was in French less participants joined. The participants were less African based then expected. Learner participation was quite constant throughout the MOOC (for those participating actively). Weak efficiency of distance meetings. Question: did you get remarks regarding the Northern tech that is used as a symbolic gatekeeper? Trying to figure out what exactly you can do with it, with internet. He is a teacher by nature. He recounts the moment where he thought (as a teacher): what am I doing, what am I missing, what is out there and what is not. Coming together with the community of EdTechTalk, a lot of problems arose, so it was hard to build a community. In the summer of 2008 he came across of George Siemens and Stephen Downes, and as coincidences happen Dave said “the course you are making could be called a massive open online course”, hence the word. Julius Caesar taught himself to talk the birds out of the trees. He did this to see one guy Molin (also taught Cicero). But while traveling there, Julius got capture by pirates, but he got out, learned and returned to kill the pirates. So learning was dangerous, costly… but it was the highest option in learning, as he could have access to the best mentor. But mentors do not scale very well. At the university of Toulouse students scrutinizes the bosom of nature. So Aristotle was censored, but an underground movement invited people to get access by going to Toulouse, not the censored Paris. So in 1229 AD the scale of texts was enabled, but you did no longer have a mentor but have an expert, which was better to be scaled. Pestalozzi is Dave’s learning hero (1798 AD), one of his most incredible things was: wanting to teach the whole of Switzerland to read. A mounteness country with only 100 teachers: scale of papers, and teachers…. Gertrude’s teaching. Where the pedagogy gets integrated with the text. So that way, we move to content. The textbook is a robotic process where the pedagogy is intertwined with expertise. Again tech increased the scale: fantastic for Pestalozzi. Now we have visual, digital possibilities. All of a sudden we are not restricted by print. So now we can ensure that the learning community can become the MOOC curriculum. So now we can connect directly, not via ‘tools’. Teaching at present is a myth, the roots of this myth is content. We have all been programmed to see education in a certain way, and we proof it that that is indeed teaching. Yet in 1876 AD, UK, if you could read a few lines of poetry, and slowly write a dictated sentence and do basic arythmatic, you could get out of school (after proving them). So a bit like a prison that you can only break out of when conforming to a given norm. So the process of learning was about ‘finishing’. The point is that it was not a lifelong learning process, not the love for learning. It was thought that once you left, you would stay out of school as well. The myth of content: content comes from the trees, and the core of rhizomatic learning takes down that mythical tree. The Japanese nut tree bush does whatever it wants, for it moves beneath the earth, it is mostly roots. Success is not linear, it is chaotic, complex, in all directions. Rhizo2015: at the beginning of the course, there is no content. As the 6 week course growths the content comes out. One mid-week email, not clear direction given, and social intervention. It mimics programming: first there is nothing, then it becomes the actual program. In a way the content already exists, it is out there for the participants to choose it. In the rhizo challenges is there to spark discussions. Dave does not use any lms, just the internet. Conceptually, the internet already has the connections, so the actual creation goes beyond the platform. Last year, the learners kept on going the course for another 4 weeks even after the course, just because of the creative character of the course. What Dave does do: is give social interventions. Where conflicts (pedagogy, epistemology, ontology) Dave comes in to jump in and works his way through it with all people in it. Those interventions are not opinion based, but acknowledgements to support the common basis. In one instance, rhizo2014 resulted in a radio play made from the second week, by 15 people building it. Students of rhizo do most of the curation as well, drawings, stats, …. The participation tends to increase as it goes along, which is quite amazing. And a lot of retention is about asking the right, motivational questions. Most of the target people are experienced educators for rhizo. He did try with laymen, but it is tougher for the less literate on education. (youthvoices.com is of interest that takes that approach to increase literacy). Before the course starts, Dave sends out what it takes (skills) to get the most out of a rhizo. The ability to collaborate, to engage, to respond creatively. No platform, so what is used? Dave used a hashtag to get people connected (twitter, facebook, maybe google group), the students choose the locations, and those locations get sent via the newsletter of the course. So Dave sends out one blogpost and one tweet, with a link to blog with sign-up that offers the newsletter. Having regular scheduled emails is a real bonus to keep communication going. If the location is open, then the connections can sustain themselves also after the course. Dave does this on his own time, he crowdsources the research. If the goal is to produces highly reproducible content, then this is not a good approach, but for new work, this is a really good approach. Embracing uncertainty: because of the blank canvas, the conversations can go off into any direction, that resembles the life that we actually live. Enforcing independence: the learner needs to create and drive their own learning. Success becomes something personal. Radically open: it is open in a sense that people are creating their own content, and that it is open. How do you go about learning when you do not know what learning is about. So what you do is build strategies that are reactions on what is happening, and how you feel the actions are happening. Learning is a non-counting noun: if you imagine that learning is different for each student, then you know there is no ‘good’ answer. It is all about the learning journey. But it leads to a lot of confusion that happens, it is really difficult to process yourself through this. But this is what actual learning looks like: friendships, parentship, … it requires constant attention and reinvention. Networked learning process: those networks are tiny little dots where people know who is connected. some people come up with similar networks, some with new, … so everyone has a different map of understanding due to the networks they connect to. Each one of the networks has different conversations, sometimes overlapping, sometimes living on their own. But all of these connections are one of the outcomes of the course. Because the outcomes of the course are the results. So the learning process is actually cheating, as the content is out there. So cheating is part of the learning goal, as they connect with others, learn from each other in the open. So Rhizo does not sound like a course, but it is a course: no assessment, no curriculum… but it is important that people come together, those people can learn from each other, and allow us to move for a specific amount of time. The goal of the course is to orient, declare, network, cluster and focus following your own learning journey and desire. Planned obsolescence: at first Dave is in the course, by week 4 communities are set up and he is no longer in the course, he becomes obsolete. An open system designed to help people grow will provide literacies they need to know. The community is the curriculum, and the vehicle, and the goal. Being successful in that community of knowers, so success is never ending. Sharing latest paper on self-directed learning. This paper will be presented on Tuesday, 19 May 2015 at the eMOOCs2015 conference in Mons, Belgium at 11.00 o'clock in auditorium 3. The full programme can be found here. Full paper is available here (Academia). Self-Directed Learning (SDL) in Massive Open Online Courses (MOOC) is gaining interest, as online learning is increasingly learner-centred and autonomous. Most SDL research starts from the premise that SDL happens more frequently in connectivism MOOC (cMOOC) than in the more instructor-led MOOCs. In this study the authors look at SDL experiences from learners enrolled in two MOOC courses during the early trials of the FutureLearn platform. The meaning and experiences of the phenomenon of being enrolled as a learner in FutureLearn was gathered through various research instruments (online survey, learning logs, one-on-one interviews). The resulting data was collected pre-, during, and post-course. The key categories for each sub-question of the research are shared in the results and analysis section. This study concluded that SDL is indeed taking place in FutureLearn courses, which points towards SDL happening beyond the connectivist MOOCs. ict4d #mobile and #elearning challenge for refugees send your ideas! The Refugee Education Challenge (by OpenIdeo a social innovation platform, and supported by the Amplify project) is a clear, worthwhile initiative that can be answered by individual EdTech producers as well as companies or groups (corporate, academic, ngo). The challenge is simple in description, yet very complex in planning as refugees face multiple challenges at the same time, look at the ideas here. You can submit ideas through the month of May 2015. Last week EdX and the Arizona State University sent out a press release. In short they both started the Global Freshman Academy, linking university credits with MOOCs on a major MOOC platform. First reaction: THIS IS GREAT. Second reaction: let me look at the video… *watching* … well, not fully convinced about this initiative. In two weeks time I will have the opportunity to join Anand Agarwal talking at the eMOOCs conference mid May 2015, which makes it a perfect time to reflect upon this ‘new’ opportunity of offering credits to first year graduates at a small fee. For it is clear that Anand – among others – is a man with a clear educational mission, and I admire that, but … it takes a neighborhood (the globe) to really make a change happen, and as such reflection must happen by the people for the people, not by the few under the cloak of the many. That is why that although I like the idea of providing open education against small fees to all is a good thing, yet it needs to be supported by citizens and universities of the North and South. Just like everything, education is a societal system. At this moment, and mainly due to technology and an increased mobility, the national and/or regional educational realities are disrupted. Or at least, the Northern educational systems feels disrupted, in many regions education has never been fully rolled out, so in a way it has always been in a state of disruption. The disruption is mostly voiced as a result of ‘safe educational institutes’ suddenly feeling less comfortable, because where at first local people went to regional universities, all of a sudden online learning (en masse) suddenly risks to disrupt student numbers. As a student, you can choose to go to other universities simply by joining online curricula... if you are living in the North, have the capacities to learn that specific type of content (time, skills, ....). And although the world is still a quilt of different societies, slowly but surely there is this tendency to move towards a global ‘best’, whatever that might mean, I am guessing it means education provided by the one's in power (which is not that different from current education, possibly). For global – it seems to me – is used in a very market driven view when it comes to education. Multiple research has shown that radio lessons make an immense difference in strengthening education, but money currently does not go towards that proven educational option, but to the new, fancy MOOC-related options of online learning. So global is not meant to be local or grassroots supported, but Northern made, southern consumed. This is the promo video of the Global Freshman Academy, and it clearly builds on the idea of education for all, a worthwhile cause, but even now still struggling with even getting primary education for all realized. “Can you imagine a world where everyone has access to higher education?”: Is the start of the video. Well I can, but I also realise that if everyone follows the same courses, the declining job market might just be more inundated that it already is. We now face increased older populations and declining job market – so less jobs even if you graduate. So providing higher education for all, might result in a bubble. What needs to be done is education for a long lasting, happy, balanced life amidst all of us global citizens. Utopia, but feasable in my mind. Think Star Trek, think solidarity and spreading material resources to allow everyone to live a prosperous life with respect for all, nature included. “Most students that start college, do not graduate”: now here is something interesting, in the same video the message of ‘we are successful’ is given next to ‘the same uni that gives you this video also was not able to provide full graduation success’. Of course not, as many young people are still searching for what they want, what they are good at, … and they face their own demons at times related to learning, self-esteem and self-efficacy. Students are also not always equipped to deal with learning, and more so if they have a background with parents and siblings not knowing how to approach learning in those particular circumstances. “Take moocs without an application process”: although this sounds nice and is nice (I myself being without a degree up until 2 years ago – meaning 20 years of professional work without an official paper), the bottom line of education is primary/secondary education for all. Taking MOOCs is – at this point in time – still very elite in terms of language, content provided, teaching approaches used… The idea is superb, and allowing credits for a small fee (small being a globally relative concept) is of interest, but does it really amount to a better world, or is it only going to reshuffle knowledge regions? With people braindraining regions with less opportunities to locations where there seems to be more chances? “deep learning experience that humans have ever been able to develop”: two remarks: the cultural biased idea, and the fact that MOOCs at present do not always (ahum, read only infrequently) offer deep learning experiences. On the cultural aspect of that sentence: no, I do not take that as a fact, of course there is scale added to current online education, but deep learning has been, and is being done, across continents. Good education is not limited to a region, it is limited to our human boundaries/capacities. There are good teachers all over the world, those who seem to be born to educate and lift spirits up to new heights. Bringing about change never happens overnight (well, unless it is use of technology it seems, but looking at human, mind-set change). If we want higher ed to lead to change, we need to change what all of us can do after we graduate. Lack of jobs, unequal pay, reduced job diversity as a result from increased automation… all of this points towards the need of setting up a new society. No longer aimed at production and work, but at creativity, self-regulation of life, balancing resources to allow a global population to enjoy life, and not having to fight for it in a literal or virtual sense. Not saying anything about the fact that credits for freshman might be a tough nut to crack for global credit agreement (and that it feels as though the norm is pushing their system onto other educational systems), I see it as a pity that it starts from a non-participative approach. Where education should by nature be participative. There are benefits deriving from MOOCs, but we need to make sure that all of society is also rethought, and changed to improve all of our lives. This morning I was cognitively mesmerized by the seminar on 'capturing an online student feedback history to enable ipsative assessment and sustained motivation' presented by Gwyneth Hughes. Liveblogging from CALRG seminar, so typos and incomplete sentences possible. 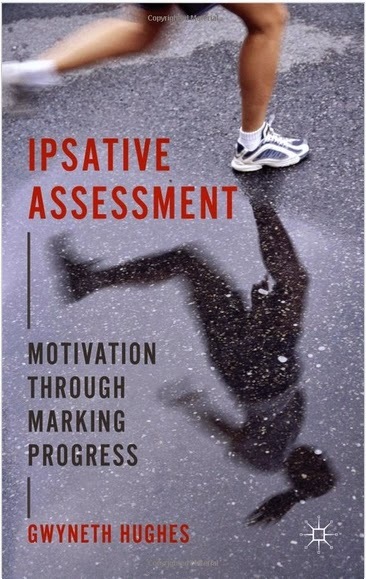 A WONDERFUL seminar, really worth it, so buy the book Ipsative assessment: motivation through marking progress! Or read Hughes papers. Ipsative assessment: compare it to your own personal best (e.g. in athletics, personal sport…). And why this is of interest: because it is much more related to self-determined, self-directed learning, as the learner looks at their own journey, not the final product comparing it to others. As such this personal growth is an interest for higher education, and more specifically it would be good if a more personalised (personal best) assessment might become part of formal education. (remark to myself: use this for the CLIL MOOC project). Most of the time is a measurement of learning and marks. So assessment is the pinnacle of meritocracy (broadfoot, 1996). This approach risks to be de-motivating to others, and it does not necessarily result in selecting the best students. Does criterion referencing remove competition? No, as there is evidence that by marking teachers do rank their students, this makes marking – in part – subjective. So, classic assessment is not necessarily objective, nor normless. Problem of how to maintain self-respect where there is unequal talent and success (Sennett, 2003). Most of the time, most people will not achieve perfection or excellence, but most people will make improvements most of the time (Hughes, 2014). Assessment pass threshold is only the starting point (a diversified starting point), and looking at the ipsative view of assessment you look at the learning progress from the initial starting position. What to do about students who are not progressing? If they do not move, ipsative assessment can be used to identify students who are not progressing, which would be a student of real concern. Thinking about the feedback on your draft (or previous) assingmnts please indicate what you took out of that feedback, and whether they wanted some particular feedback. Potential use in all scenarios, but … the EdD programm is very large, so 100 of supervisors that would be very useful of those people’s feedback, but some supervisors did not all have access to the tool. Staff development through sharing feedback practice and consistency across their programme. Learning locker: the learning path overlap? 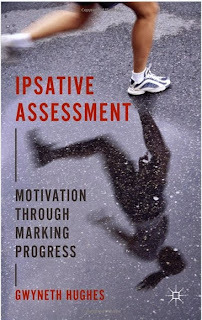 Ipsative assessment is a powerful and under-used approach that provokes a radical rethink of the purposes and methods of assessment (Hughes, 2014). In higher education a strong focus on grades, marks and the implicit ranking of students in a competitive system means that it is not possible for the majority to excel and for many learners it is difficult to maintain self-esteem and the motivation to learn (Dweck, 1999; Sennett, 2003). By contrast, ipsative assessment means an assessor makes comparisons with a learner’s previous work to record progress and enables learners from all backgrounds to achieve an academic ‘personal best’. However, ipsative assessment requires that learning can be easily tracked over time and that students can demonstrate how they have built on feedback to meet self-identified goals. The Assessment Careers project at the UCL institute of Education explored how technology could support feedback over a whole programme and not only at the module level. Feedback was stored in many different places, sometimes in the VLE but not always easily accessible to a tutor and it was difficult to follow whether or not students had engaged with feedback. A Moodle plug in was developed to enable reporting of a student feedback history over a programme and the system was piloted with an EdD programme. In this presentation, the feedback history report will be demonstrated along with some of the findings of the pilot. Some of the challenges of introducing technology enhanced assessment processes will be discussed in particular in this case when the underlying principle – ipsative assessment and feedback – is not fully discussed by participating staff and students. 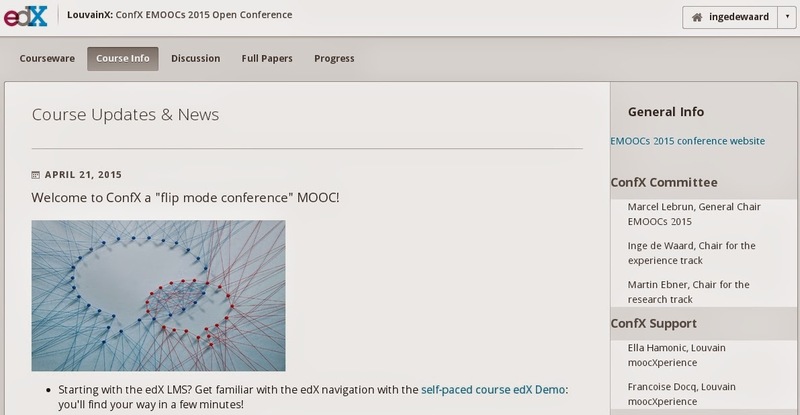 The eMOOCs2015 conference will be starting in two weeks, and as a pre-conference treat videos and discussions on 10 top papers are presented in a real EdX MOOC format. By offering the videos and discussions prior to the actual conference sessions, we (= all conference organisers) hope to get a more in-depth discussion going during the sessions themselves. I will be chairing the flipped sessions from the Experience track, so I look forward to the results and discussions. MOOCs are opening up new opportunities for faculty members to flip their classrooms. Can we apply this educational innovation to scientific conferences by flipping the conference room? 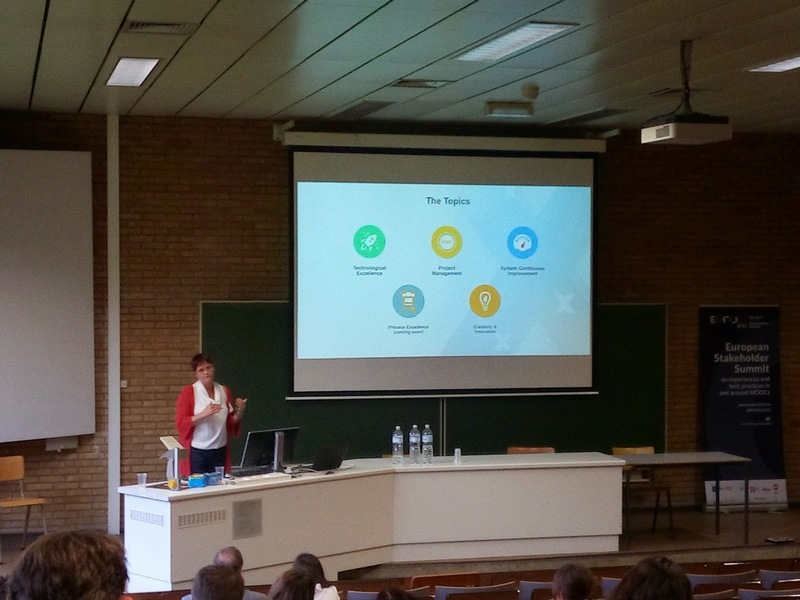 By bringing these principles from the academic field to the scientific context, EMOOCs 2015 seeks to evolve and challenge traditional conference organization. 10 out of 36 papers from both the Experience and Research tracks will be presented following a flip mode: authors have chosen to prepare short videos explaining their results and research questions, and to share them before the conference begins. You can now discover the content of these papers and start the conversation online… During the live conference sessions in Mons, you’ll get the opportunity to deepen the discussions with your peers and the authors. These 10 papers, videos and quizzes constitute a MOOC called “ConfX EMOOCs 2015 Open Conference”, which is now accessible to everyone. This course is designed primarily for attendees of the EMOOCs 2015 conference, but is also open for all to engage in public discourse around MOOCs more broadly. 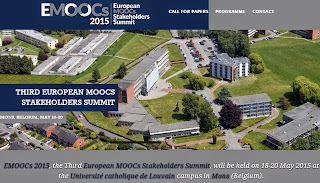 EMOOCs 2015 is not only a flip mode conference but also an open one! What you need to do? Register register now for EdX and discover the ongoing research on MOOCs and start preliminary discussions before the meeting in Mons. Spread the word and invite your colleagues - who may not have the opportunity to join us in Mons! They can join us online! 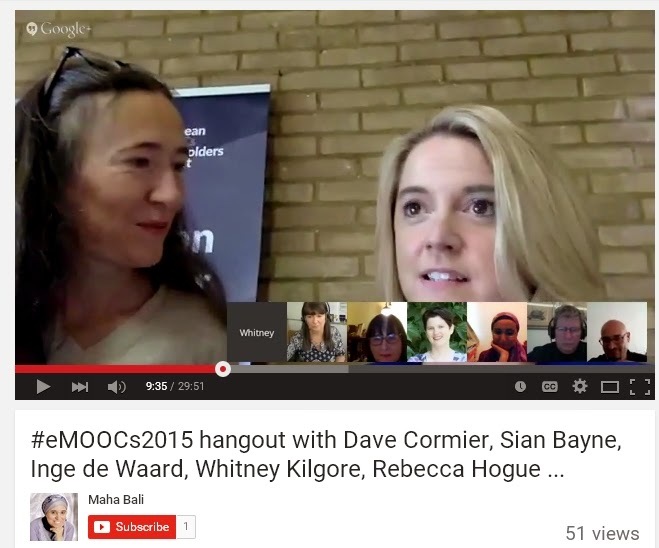 Do you feel you need to better understand what MOOCs are? Would you like to get a stronger sense of the variety of learning activities they can offer? Are you curious to discover more diverse ways of designing MOOCs? If so, then this pre-conference activity “Creative design for MOOCs” is for you! Come on Monday May 18th, from 10.00h to 12.00h, just before the EMOOCs conference starts! This activity will be organized as a barcamp: a participatory workshop event where content will be provided by participants. 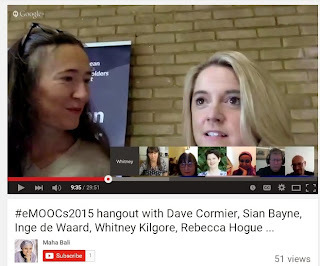 MOOC authors will share with the community their MOOCs’ instructional design. You’ll be invited to come and walk among the stands, talk to the presenters, and discover innovative ideas on instructional design that foster significant and interactive learning. In addition, you’ll be asked to collect all the great ideas you discover and to bring them back to the community and organizers. With the resulting, collection, we intend to compile a collective publication gathering creative MOOCs’ instructional designs. See you in the welcome hall of the conference on Monday morning! Have you already organized a MOOC that you are proud of? Would you like to share your experience during this pre-conference activity? You are invited to take an active part in the barcamp: show and explain one particular MOOC design element you find amazing / creative / rare / original / particularly well done / very efficient etc. : one learning activity, one assessment activity, one particular way of interaction with students, etc. Bring your computer (full charged), screenshots, poster… or whatever tools you find useful to share your enthusiasm… and take your place as a presenter in the barcamp! Interested? 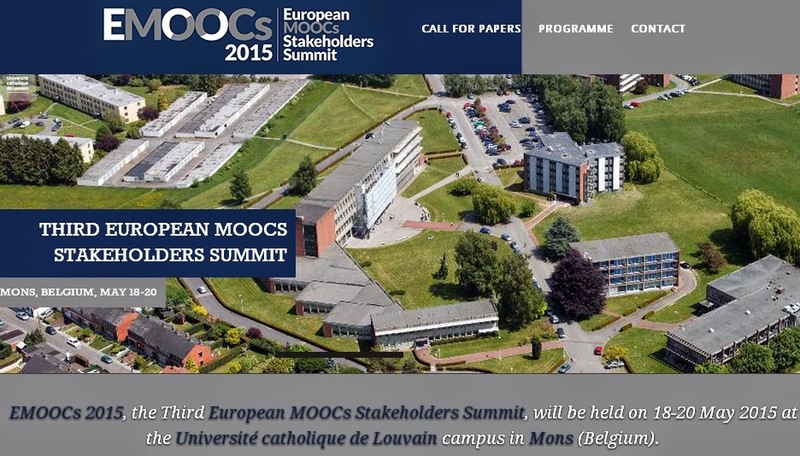 Please contact pre-emoocs2015@uclouvain.be for registration info and further details.